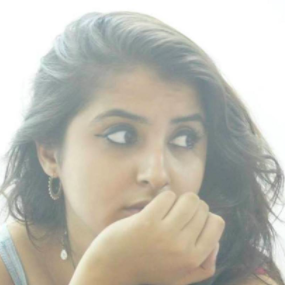 Outhouse Jewellery Just Launched A Mehendi Collection And It's Every Bride's Dream! There's something about shimmery accessories that just make the entire look come together, right?! You could wear the most basic outfit, but that one pair of earrings or that one neckpiece can instantly lift the entire look. This is especially true at weddings, even a plain lehenga can look glam with a statement matha patti or a layered necklace. But the options for shaadi jewellery are a whole lot. However, where most brides get stuck is what to wear on the mehendi ceremony. There's always this dilemma whether to go for floral jewellery pieces or classic ones. Well, we say mix 'em both together. 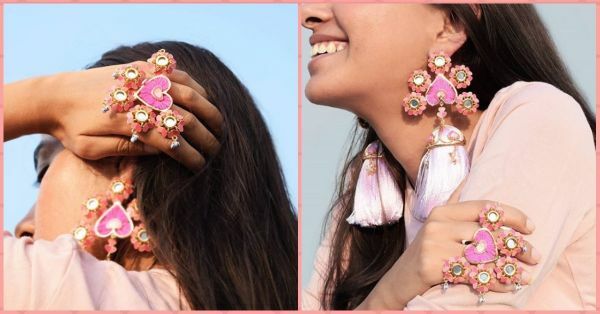 Outhouse Jewellery just released their collection for mehendi jewellery, and brides-to-be, you're in for one heck of a treat. Just look at this set of earings and ring, aren't they just stunning? The different shades of pink compliment each other so well. And we love the tiny jhungroo detail. You can pair this with a pink lehenga if matchy-matchy is your jam. Personally, I like me some contrast so a turquiose, teal or grey lehenga would make a great option. Those 'candid' shots of you flicking your hair back along with these tassel earrings will look oh-so-gorgeous! Another stunning mirror work piece. This mathapatti can be paired with the pink ring to create a fun mixed-matched look. OMG! I think I just went to jewellery heaven after seeing this. Layered necklaces are so on trend but there's something delicate and dainty about this one. From the pearl choker to the little heart-shaped details, Sonam Kapoor's got nothing on you! Pair it with a plain blouse and let the neckpiece do all the talking! If you're a fan of thread-work, then this colourful set of earrings is right up your alley. And those crystal stars, yes please! This maangtika is perfect for the sister of the bride. Twin togther on this celebratory occassion and look ultra-glam while you're at it. The 'Bougainvillea Spell' ring will make your henna hands look ultra glam, in real and in pictures! If you're going for an Indo-western avataar, this orange pair is perfect. Pair it all together with these fun tassel kadas because who does sone ke kangan anymore? !